1933 Road Near Mt. Rushmore. Charles D'emery was a Connecticut-based photographer hired by Gutzon Borglum (and later the Park Service) to document the work on Mt. Rushmore. 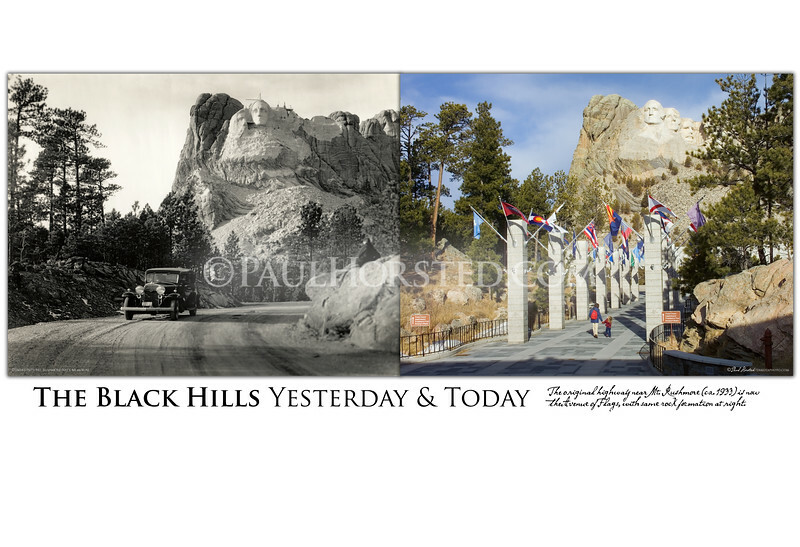 He took many outstanding images of the monument as well as the beauty of the surrounding Black Hills. Here we see a car that appears in some of D'emery's other images, as well as a figure sitting on rocks at right, in front of the partially-carved mountain. The earlier image can be dated by the emerging image of Jefferson to the left of Washington. Inadequate rock in that area caused Borglum to remove the carving by 1934 and start over on the other side. Today the former highway is the Avenue of Flags leading to the main viewing terrace at Mt. Rushmore. Note the same rock formation at right, with several feet of earth removed from around its base. ©Paul Horsted, All Rights Reserved.